Hello friends! Today I have a card to share that I made for our latest challenge at The Kraft Journal! 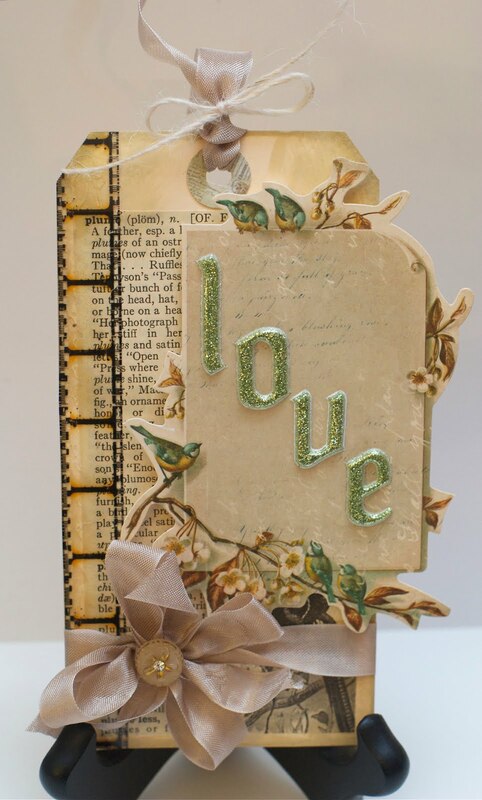 This week, we're looking for projects that are "So Romantic" and I can't wait to see what you create! Since we just celebrated our 5th wedding anniversary, I think I'm in an anniversary kind of mood lately and thought these new papers were so romantic!! 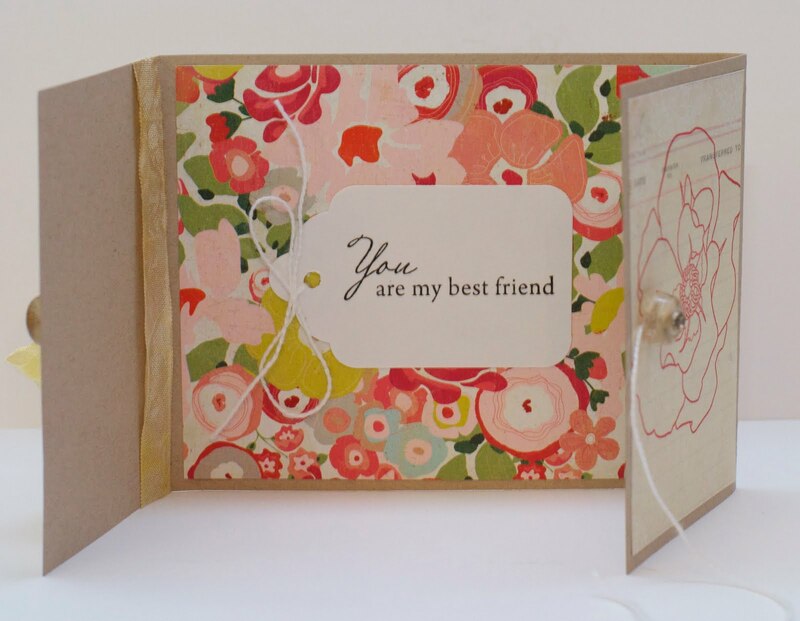 I started off with a base of light kraft and then stamped the large label on a piece of recycled chipboard and the smaller coordinating label on a piece of cream cardstock. I finished the card with some seam binding and a love ticket. Link up by Sunday for a chance to be in our Top 3 and to be eligible to win a Kraft Outlet voucher! Hello friends! 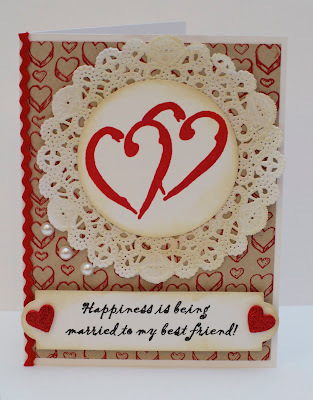 Today I have a card I made for our new sketch challenge over at Waltzingmouse Sketch Challenge! I had a lot of fun with this sketch and can't wait to see how it inspires you! 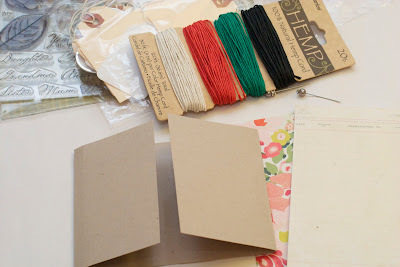 The color scheme is also perfect for this week's "Fancy Schmancy" Tuesday Trigger over at Moxie Fab World! I started with a white card base and stamped a sheet of patterned paper with one of the backgrounds from Musical Backgrounds. I stamped the cake from Eat Cake onto a dark brown sheet of paper and embossed it with white embossing powder. I love that I get a white cake but you can really see the layers with the contrasting background! 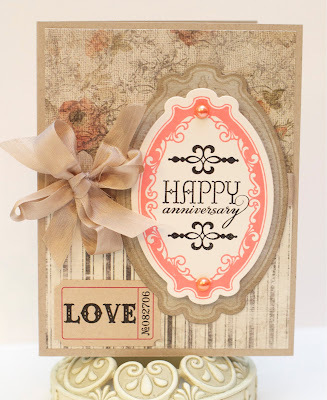 I cut the cake out and layered it over a stamped stand and sentiment from Big Day Additions. The scalloped border at the top was from another piece of coordinating paper and I added some ruffled trim to finish it off. I hope you were as inspired by this sketch as I was! Link up by Friday for a chance to be one of our Top Mouse winners and one random participant will win a WMS stamp set! Wow! Hello friends! 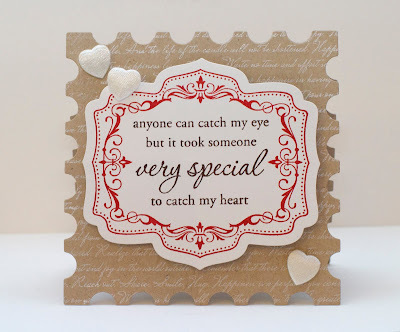 Today I have a card to share with you that I made with one of my new stamps from Rubbernecker! 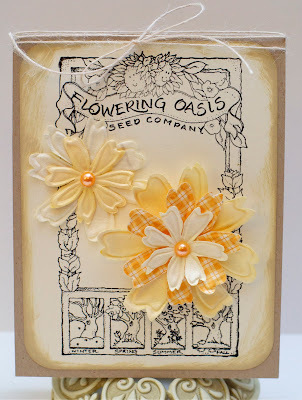 I just love this seed packet image and chose to make a simple card so it would stand out on its own! 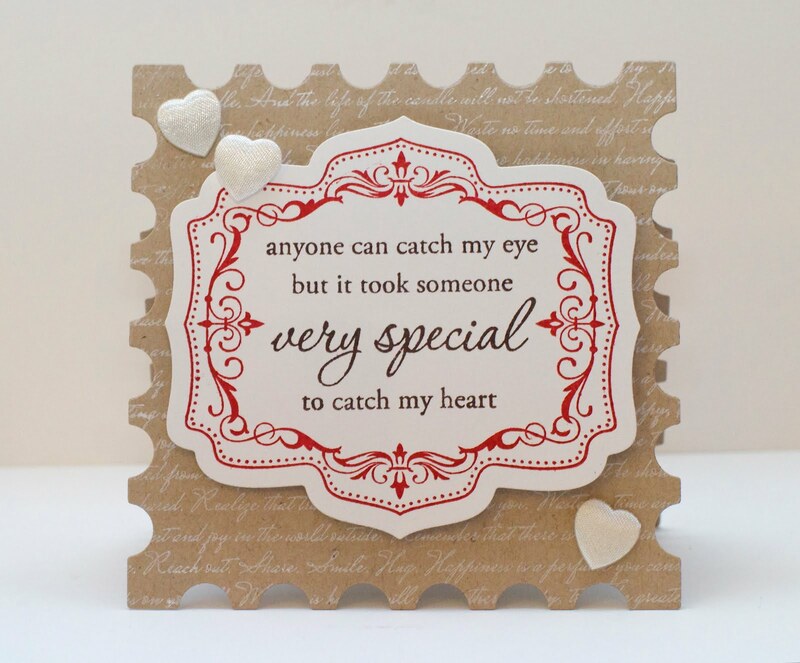 I stamped the image onto cream cardstock and mounted it on a kraft card base. 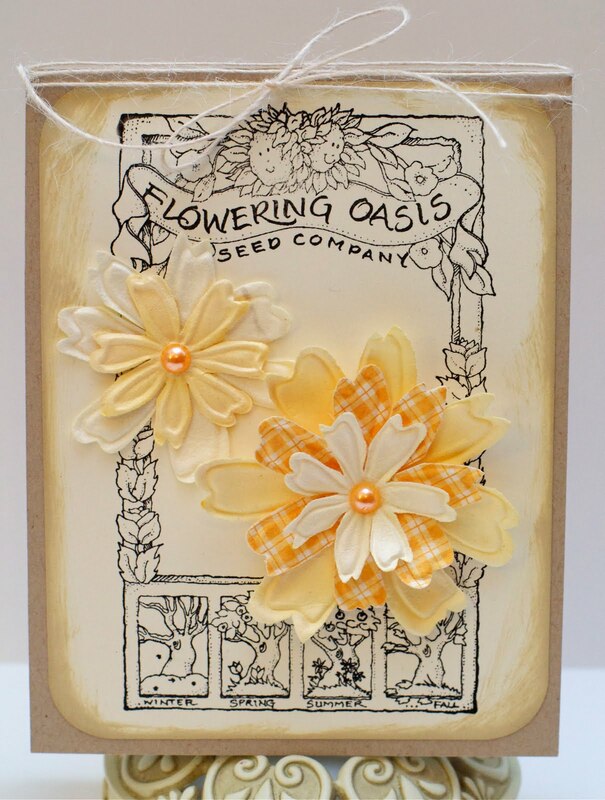 I layered some yellow Prima flowers, gave them some pearl centers, and finished the card with a twine bow. Hello everyone! 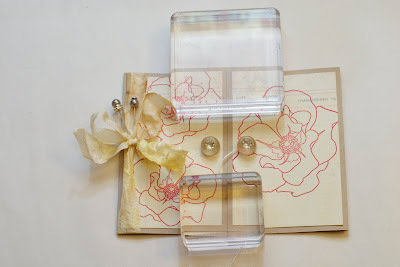 I'm back today for this week's "Tie it Up" challenge at The Kraft Journal where I immediately thought of a gift tag to "tie up" to a package! I started with a base of a large shipping tag that I topped with a decorative reinforcer. I layered some trimmed vintage dictionary pages and film strip ribbon and then topped the tag with an ephemera card, some seam binding, and some alpha stickers. I've been loving collagey-type things lately and I can't get enough ephemera (though my storage would say otherwise!) I think this turned out super and I love the vintage look of it! I hope you get a chance to play along with us this week! Hello friends! 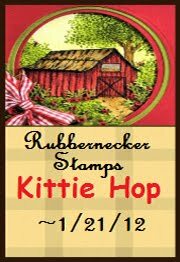 Thank you for joining in our Rubbernecker Stamps Kittie Kit Hop and we are so excited to share these fun kits with you today!! There is a HOP ROUTE for you to follow below and make sure to comment along the way to be eligible for our prize - a Kittie Kit of your very own! Fun! For this card, I chose the Beach Kit which has some really cute beach images in it including these three wonderful ladies! I sat them on a "beach" of kraft cardstock and added some tiny little gold shells. 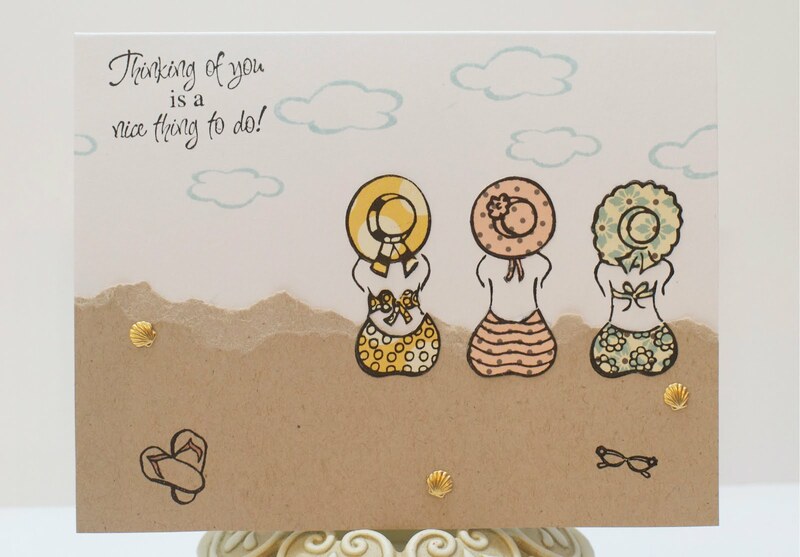 I pieced their suits and hats from a coordinating paper collection and finished the card with a wonderful sentiment. The winner will be announced Friday 1/27 so you'll have plenty of time to hop. Be on the look out for our next hop coming in February. 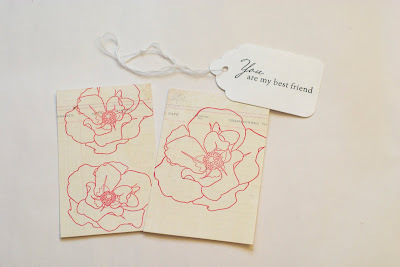 Until then, be sure to check out the daily posts on the Stampin' Sisterhood blog - there's lots of inspiration to be found! Happy Saturday, friends! Today is challenge day at Waltzingmouse Sketch Challenge and we have another wonderful sketch for your inspiration! I can't wait to see what you all come up with! 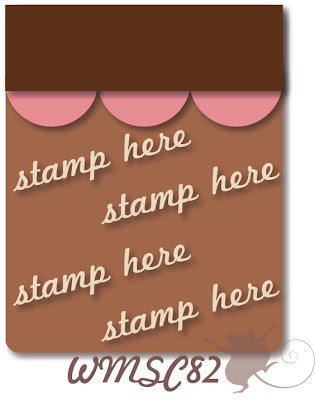 Remember, if you don't have any Waltzingmouse Stamps, there are a lot of freebies in the shop that you are more than welcome to use to play along! I saw that small square in the center and thought to make for little squares to make up a larger one. 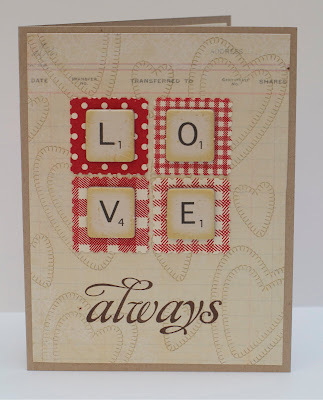 I stamped every pattern from Gingham and Co. and then punched a square of each with a postage stamp punch. I used the same red ink on each but love how the pattern variations really impact how the color looks! I cut a sheet of patterned paper and then stamped the hearts from Sewing Box Hugs to give it a bit more of a pattern and finished with a sentiment from Say it Loud. 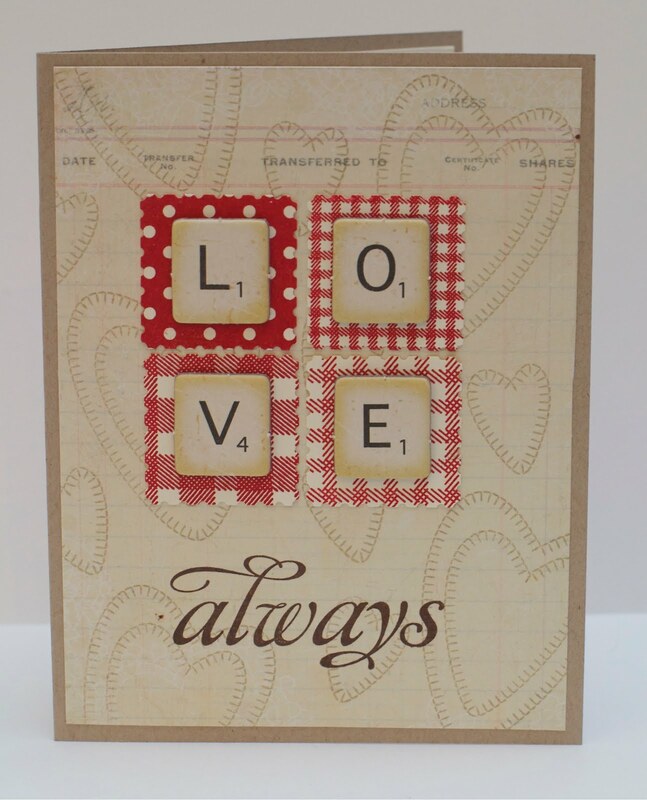 I finished the card with some Scrabble tile chipboard stickers and really like how it turned out. I started with a standard 4.25 x 5.5 card base made from light kraft cardstock which was folded twice for a french door effect. I start most cards by getting out a ton of supplies and then pare down until I find what I'm going to use. I measured and cut two panels from a sheet of patterned paper and stamped them with a beautiful rose image from Waltzingmouse Stamps and stamped a hang tag with a sentiment for the inside of the card. 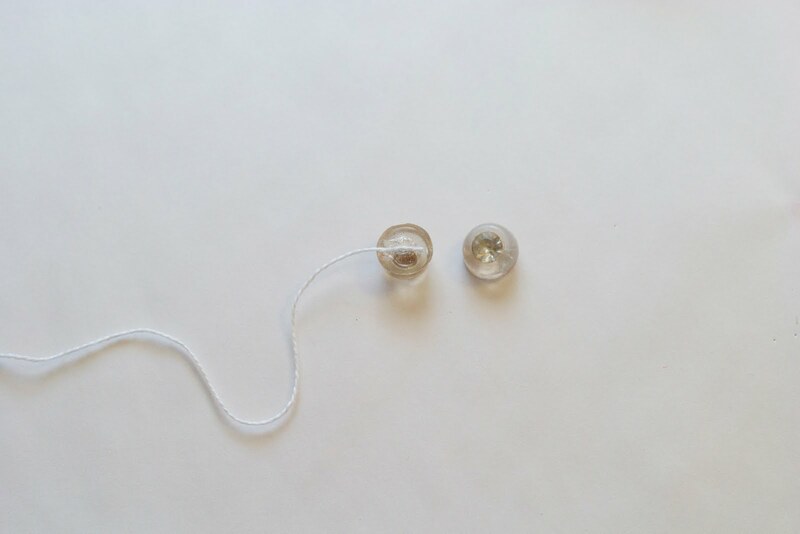 I glued some hang tag string to one of a pair of vintage rhinestone buttons. 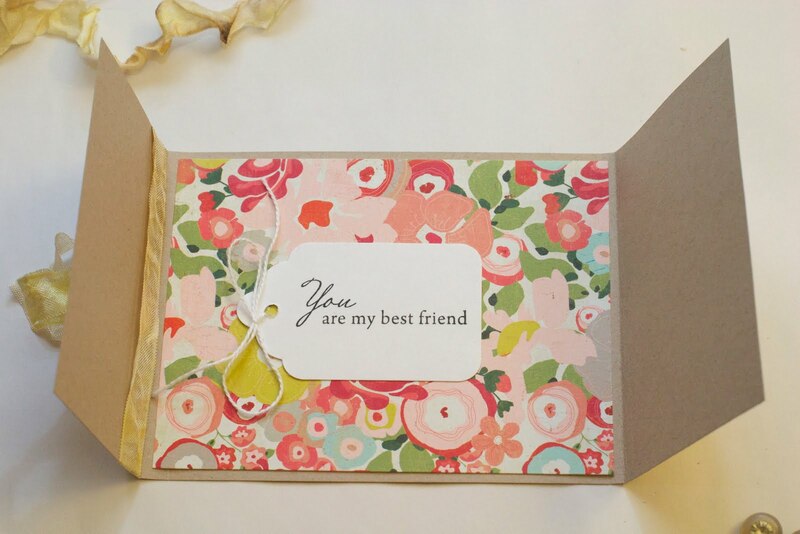 I adhered a panel of patterned paper to the interior of the card and attached the tag, tying the string in a bow. I tied some shabby ribbon around one of the "doors", used two stick pins as decorative accents, and glued the buttons down on the card. To close the card, I simply wound the string around the two buttons! 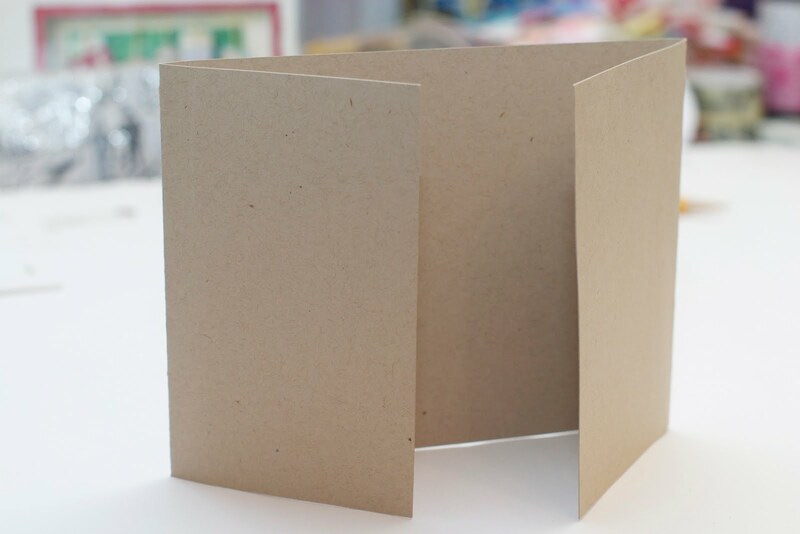 Here is a view of the finished card's interior! 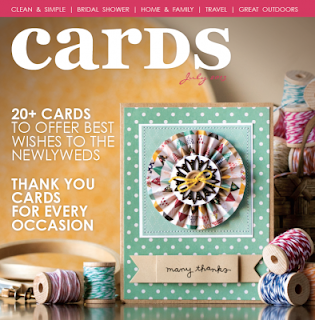 I can't wait to hear about every day items that weave their way into your craft projects! Hello friends! Today is "Tuesdays with the Team" day at the Rubbernecker Stamps blog and I'm happy to feature this tag! I stamped the baby bottle image twice - once on gray paper and once on yellow paper coordinated from the Farmhouse Collection. I cut the bow from the gray image and pieced it over the yellow image for some added color. 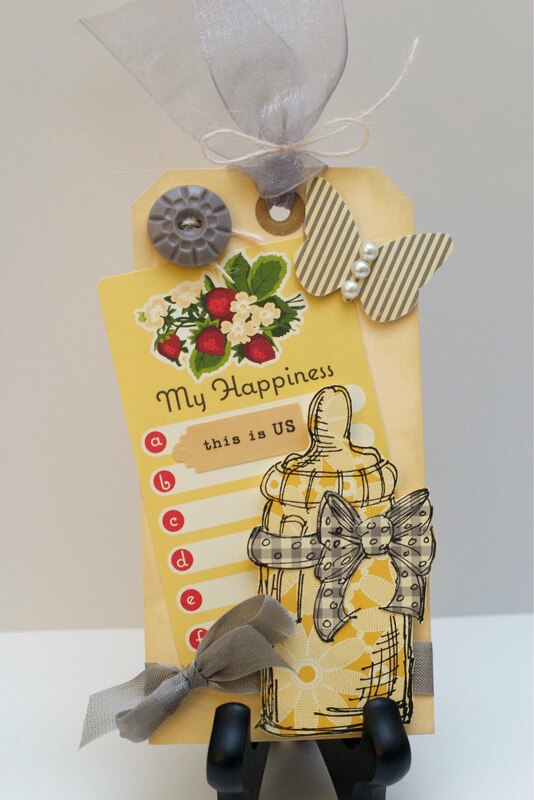 The tag also features a coordinating die cut, chipboard butterfly covered with another sheet of Farmhouse patterned paper, and a gray button. 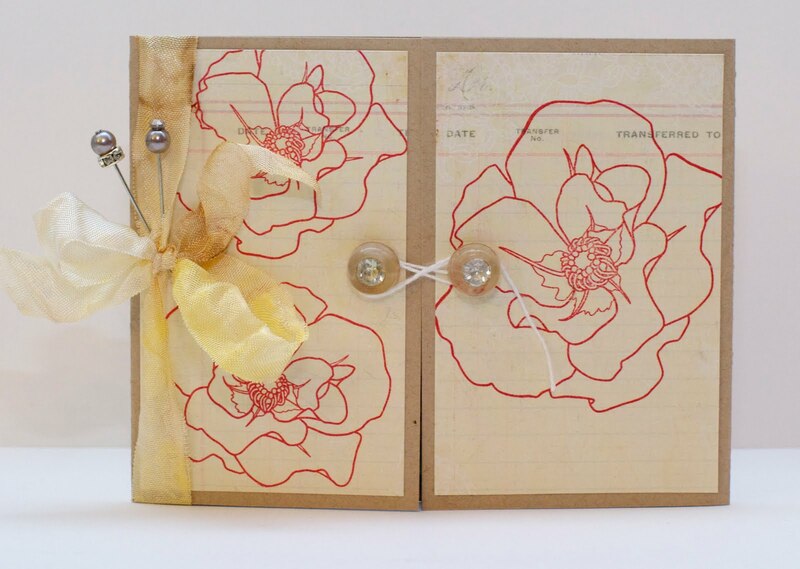 If you love to stamp on scrapbook pages, you may be a perfect fit for our design team! Head over here for all of the details! Hello friends!! 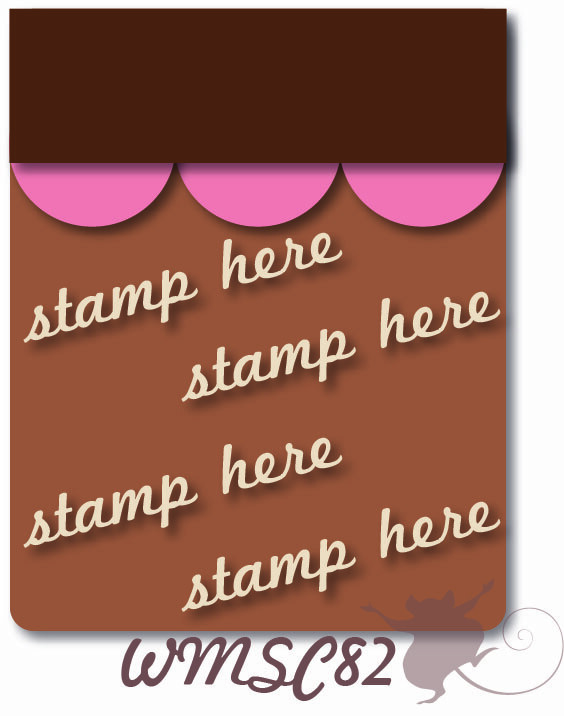 Today I've got a card I made for this month's Waltzingmouse Stamps Blog Party! 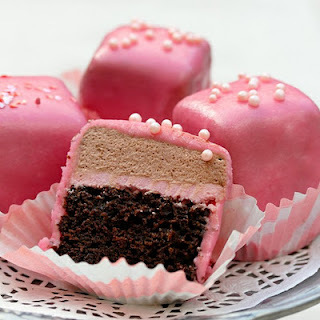 If you're new to the party, every 17th of the month, we all get together to celebrate Waltzingmouse with a themed party and this month we're all making "sweet things." I made this card for my husband - we're celebrating our 5 year wedding anniversary this Friday! He is definitely the sweetest thing in my life! 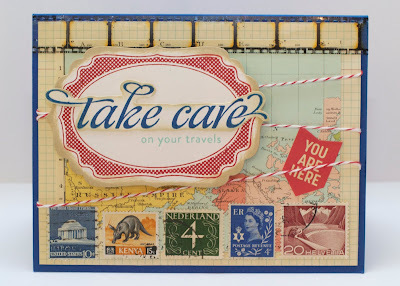 :) I started with a postage stamp card base stamped with a stamp from Text-It. I stamped an image from the Labels 5 set and a sentiment from Sweethearts and finished the card with some little puffy, satin hearts. I can't wait to party with all of you and am excited to see what you all create! I bought some vintage postage stamps while we were on vacation last summer and have been having lots of fun playing with them lately (look for a card using them in an upcoming Paper Crafts special issue! ;)) With that as the start, I thought travel-themed papers and a sentiment would be perfect. I finished the card with a layer of filmstrip ribbon and some baker's twine. 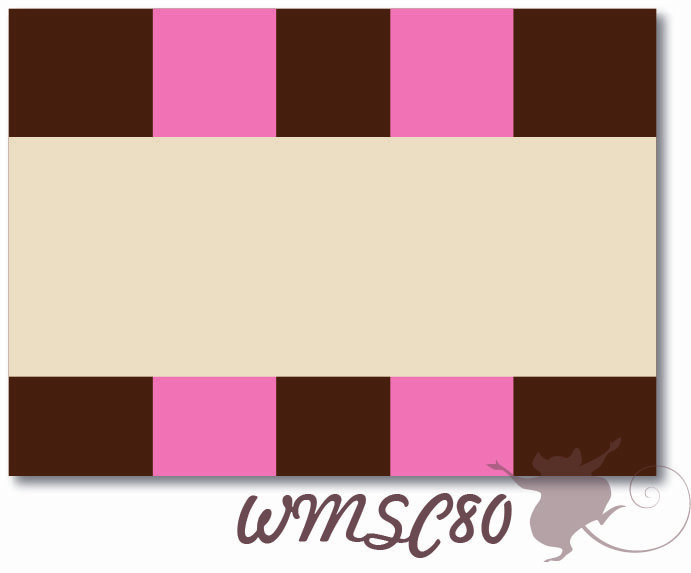 Link up by Friday for a chance to be crowned Top Mouse and/or win a set of your choice from Waltzingmouse Stamps! Whee!! Hello friends! 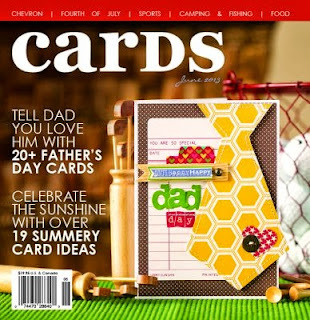 Today I have a post for a card that is featured in the January issue of Cards Magazine! 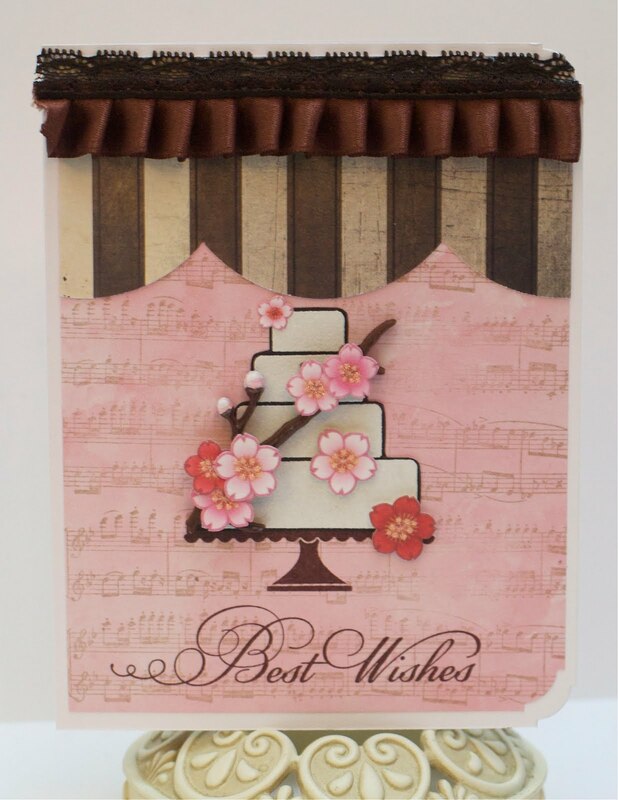 I was so thrilled to have this card chosen as it was a new technique for me and one of the first cards I created as a member of the Rubbernecker Stamps DT! I stamped the Dark Garden background stamp three times in varying shades of blue and then carefully cut the panels into strips and reassembled them on the front of the card. 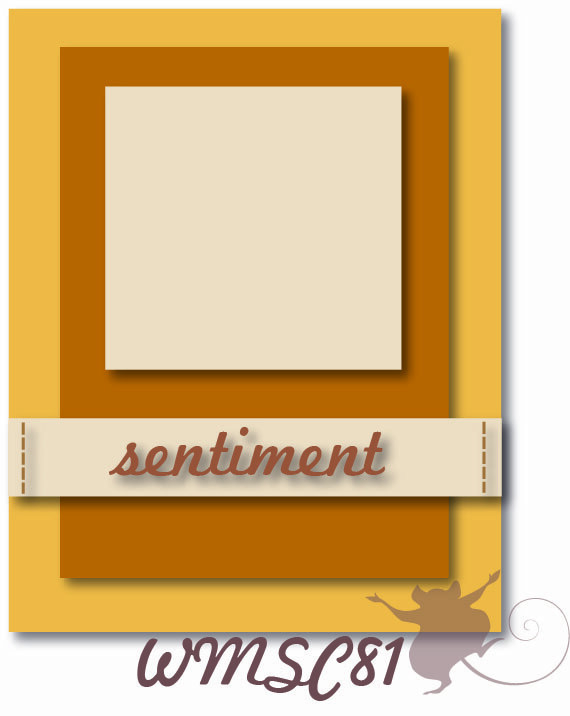 I finished the card with a sentiment tag tied to shabby ribbon. Hello friends! Today kicks off another fun challenge at The Kraft Journal and this week we're challenging you to use your favorite colors! Now this should be an easy one and I encourage all of you to play along with us! All you have to do is use kraft on your project or any product purchased from The Kraft Outlet to be eligible to win some great prizes! Two of my favorite colors lately are deep aqua and gray and the new papers from the OA Farmhouse collection fit the bill perfectly! 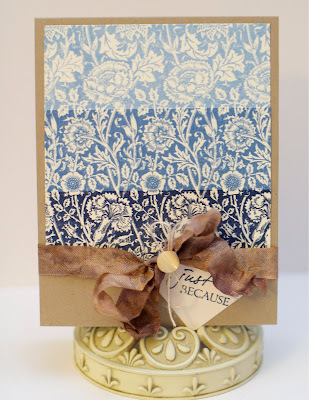 I used a lunch bag kraft card base and stamped a hang tag with the wonderful Cameo to Go set from Waltzingmouse in both colors. I finished the card with some hemp cord and seam binding and even found a coordinating ticket in an ephemera pack! 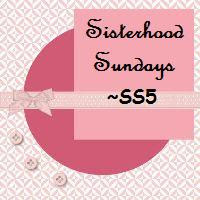 Don't forget to link up by Sunday for a chance to win! I can't wait to see what some of your favorite colors are! Thanks for visiting and I can't wait to see what you do with this sketch! A random participant this week will win the Rubbernecker set of your choice! Fun! Hello friends! 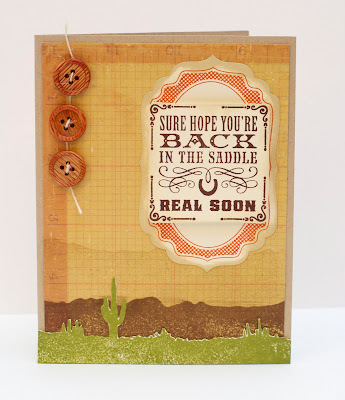 A fitting sentiment for my week as I've struggled a bit with getting back in the saddle both at work and in my crafty pursuits! I think I still have vacation brain!! Today we have a fabby sketch for you over at Waltzingmouse Sketch Challenge and I sure hope you can play along! I started with a sheet of paper with a grid pattern and stamped the bottom with two levels of mountains from the Way out West set. I stamped the upper one in a lighter ink to give some atmospheric perspective. I then stamped the cactus border in green ink, cut it out, and adhered it to the bottom of the paper. I stamped the sentiment from Back in the Saddle and a label from Labels 4 and layered them together. 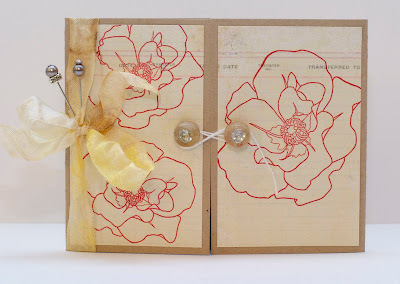 I finished the card with a few wooden buttons strung with twine. Don't forget to link up by Friday for a chance to be one of our Top Mice and for a chance to win your own set of Waltzingmouse Stamps! Hello friends! Today I've got a cute card that I made for this week's Tuesday Trigger over at Moxie Fab World! Isn't this little blanket so cute?? 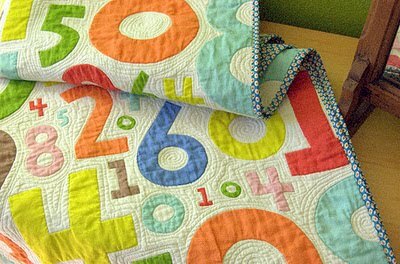 I was inspired by the bright colors and the big numbers and straight away thought of a baby card. 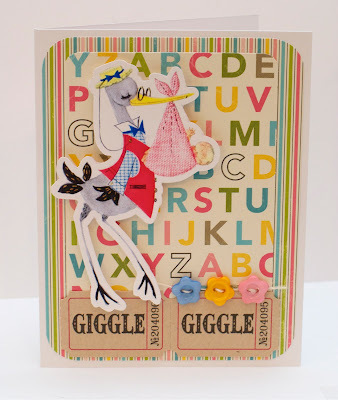 I used some colorful papers from October Afternoon and a wonderful die cut of a stork from Pretty Little Studio! 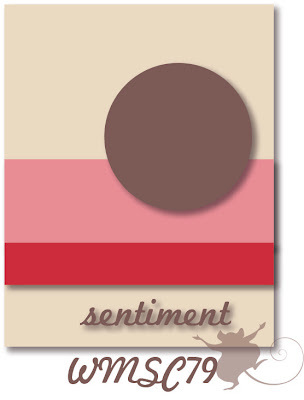 I'm a new fan of this company - their vintage lines are right up my alley! I finished the card with some buttons and a couple of tickets. Hello friends!! 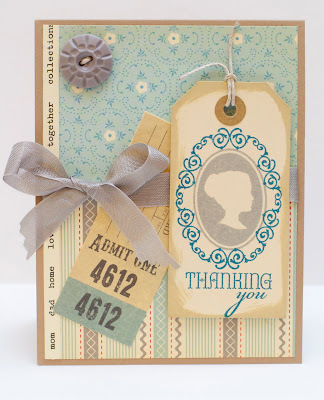 Today I've got a CAS card to share which features some adorable Rubbernecker Stamps! 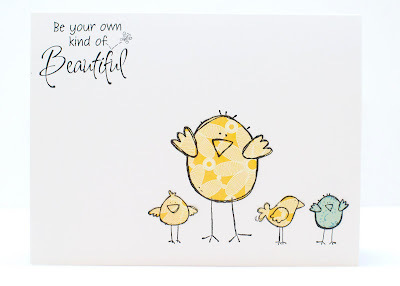 I just got these little chicks that are just perfect for paper piecing and thought the sentiment went perfectly with them! To add some charm, I used another sheet of paper for the third chick to show that you are beautiful no matter what! Happy New Year, everyone! 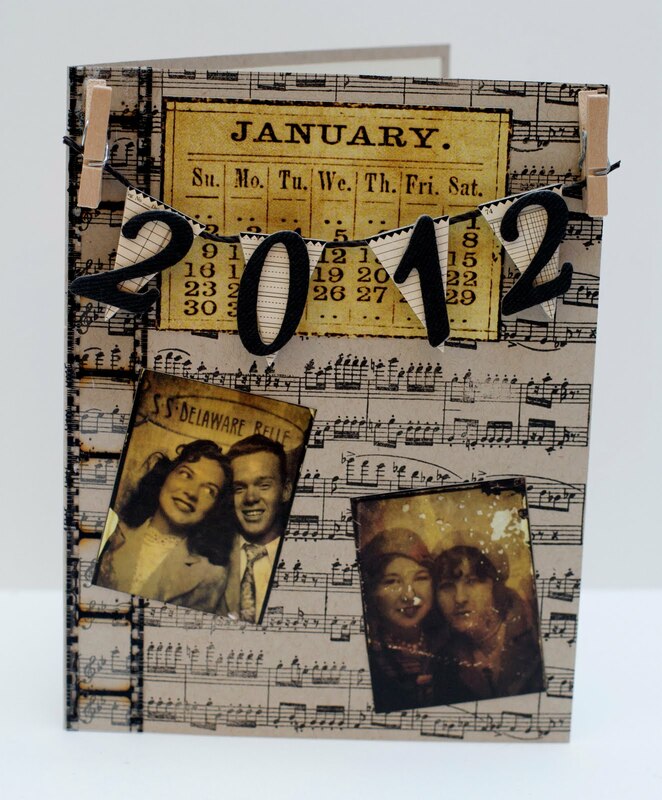 I sure hope the end of 2011 treated you well and that you are off to a cracking start in 2012! For this week's Kraft Journal "anything goes" challenge, I created this nostalgia-themed card in honor of the new year! 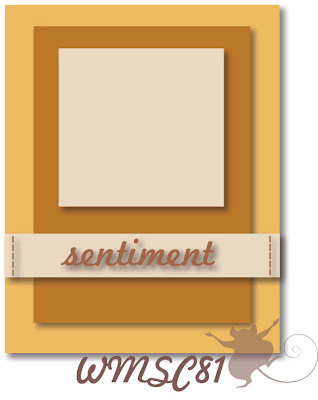 This card features a base of light kraft cardstock that I stamped with a stamp from the Waltzingmouse "Text-It" set. I then added a calendar sticker and stickers of photos like you'd take in a photo booth. I thought these really added to the festive theme of the card. 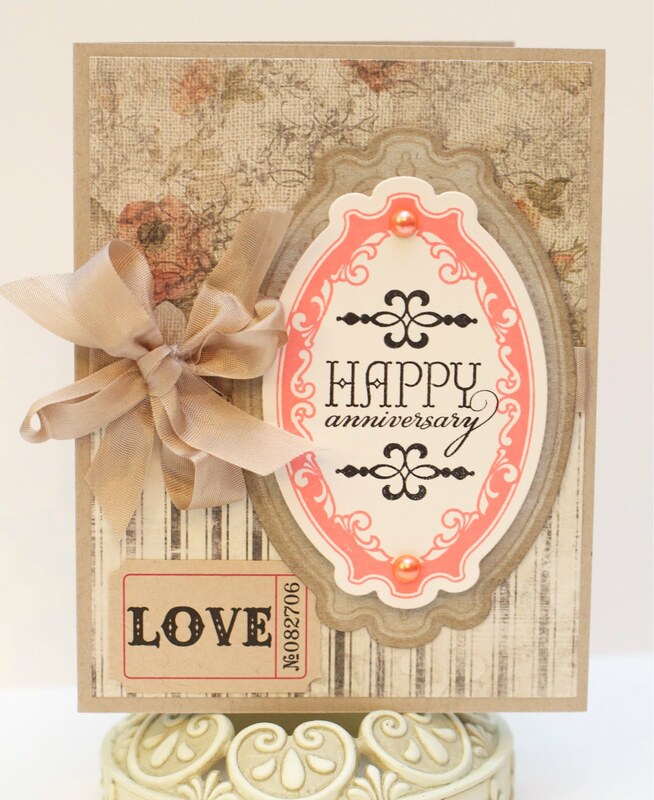 I finished the card with a 2012 chipboard banner hung with hemp cord and mini clothespins and some filmstrip ribbon.